everyday our eyes are used so much, from waking up in the morning opening wide open all the way till we get our goodnight sleep! in between, let's include staring at the computer screen probably 8-10hrs a day, and also on the mobile screen for intervals which probably tops it off with 14hrs! and because our skin around our eyes are the thinnest and most delicate part, it requires regular boost in hydration. 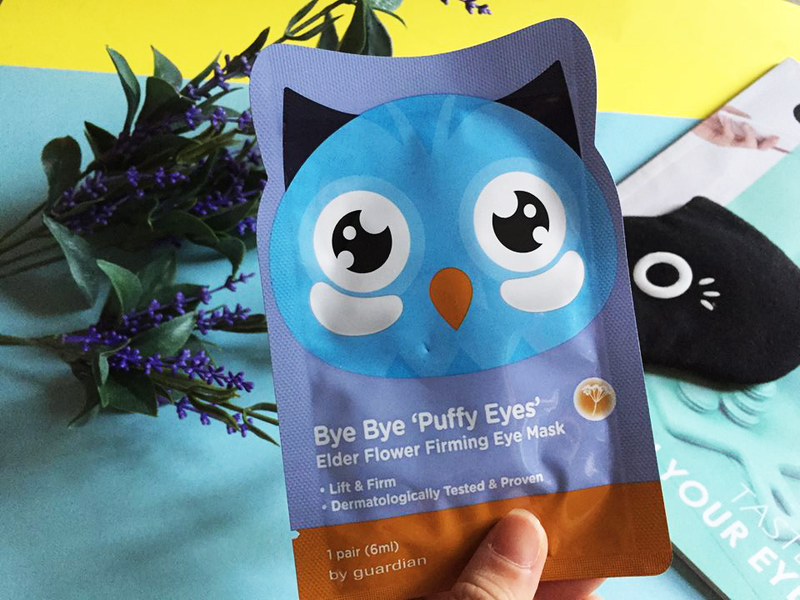 because tired eyes tend to make us look older and dull. was roaming around the mask section in Guardian the other day! and these nicely priced eye masked caught me right handed! RM6.90 for 5pcs! instantly bought them to try out! and went back for more! two word for these little cuties! 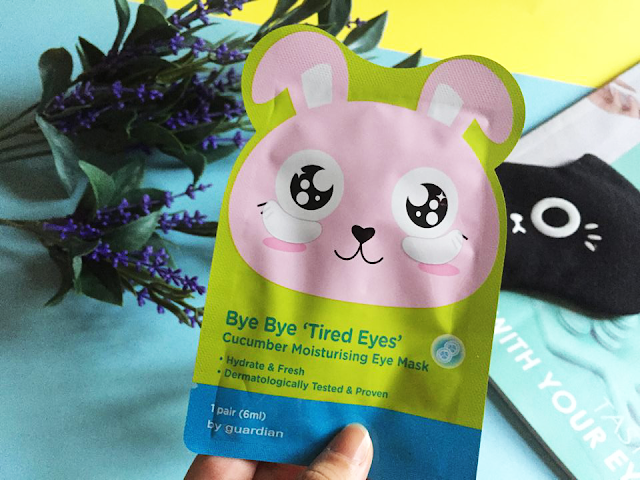 Guardian's Bye Bye Series, are focused on masks sheets for the eyes! I bought all and tried it out. the series comes with 5 types of Bye Bye effects which focuses on their own distinctive labels. 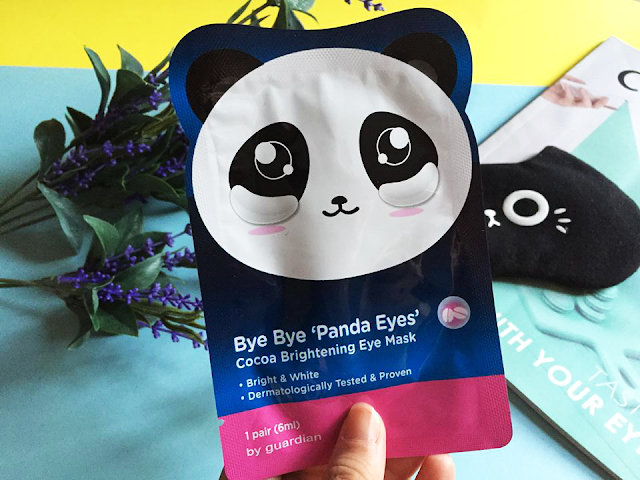 obviously i horded the bye bye panda eyes and tired eyes the most because those are my need -to -fix for my eyes! 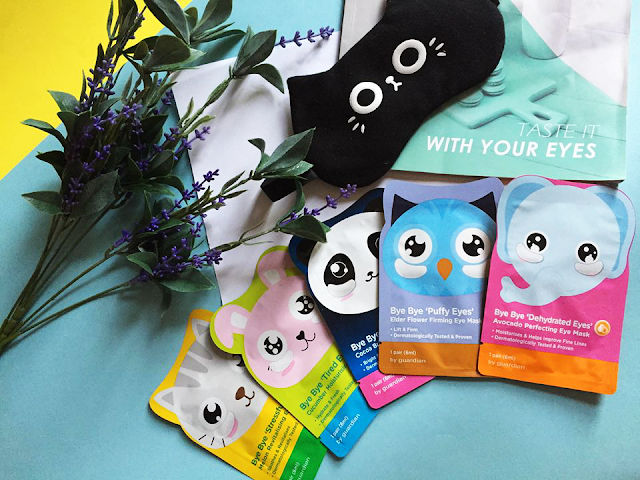 It is made of a 2-piece cotton soaked essence sheets with the shape made to fit your eye contour. 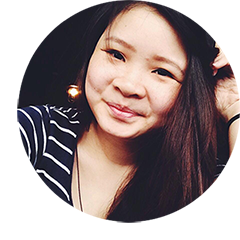 late nights and working long hours on the laptop are definitely the cause of the panda eyes, its actually also involved with our health and pigmentation from the sun/light exposure which somewhat contributes to it. i guess i'm a living breathing proof! 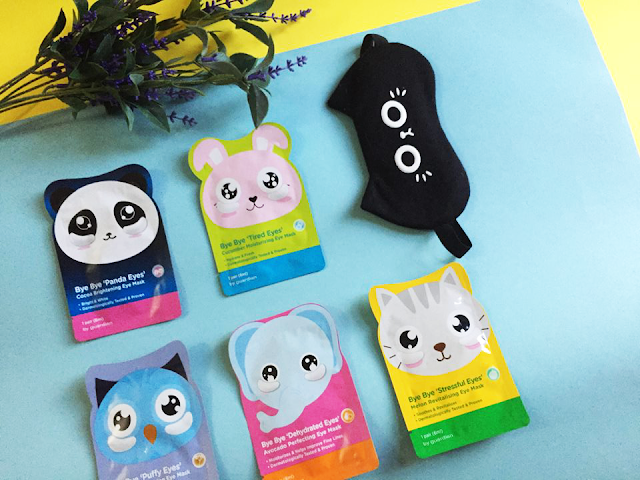 the masks is believe to brighten the dark circles and recharges its radiance. AFTER FEEL: eyes feel much more moist and relaxed. however, panda eyes can't be really gone for the most obvious reasons. call me crazy or hallucinating, but it does feel a little lighter after a few use. just a slight shade lighter - doesn't really help if you're panda eyes is like mine. SCENT: smells like a light coco powder milky. just as how it was stated on the packaging. the tired eyes are usually the caused of the lack of hydration and when we used too much staring at the lighted screens. 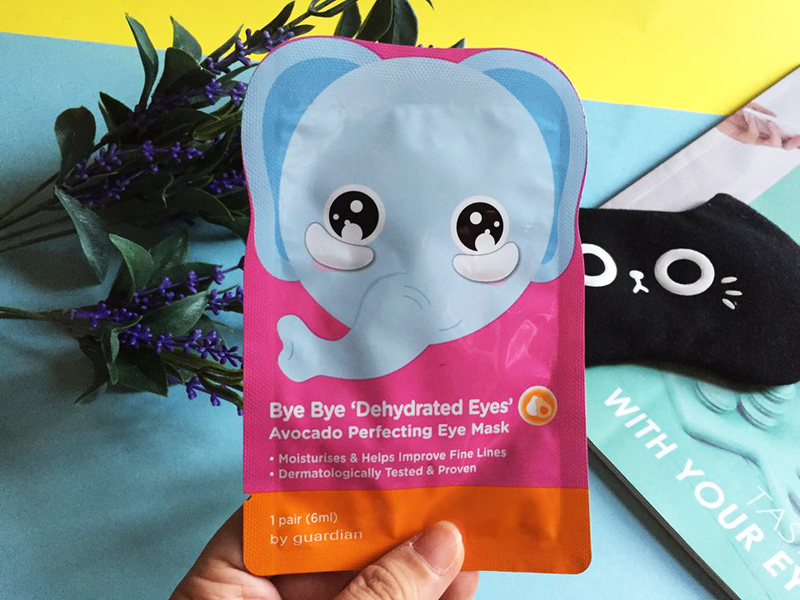 Made with cucumber and Aloe Vera extracts, this little guy helps recharge the eye contour with supple hydration with a touch of Pomegranate essence too! AFTER FEEL: eyes feels more refresh! i like this one because it really did have a little cooling tinge to it. 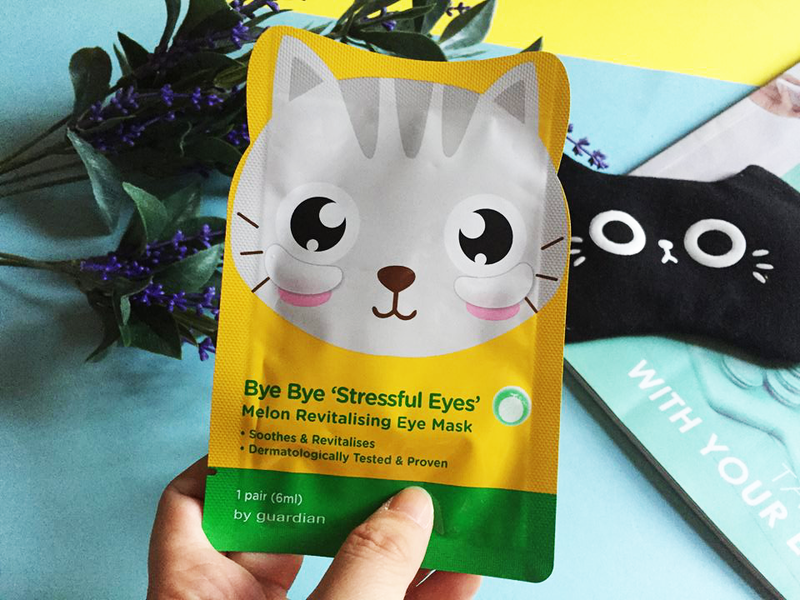 its great to put on mid-day to boost your tired eyes. SCENT: light cucumber scent, which is quite authentic. calming and cooling perfect to rest your tired eyes. pampers the eyes with a radiant glow soothing away the effects of our everyday stress. made with Witch Hazel extracts and Melon! it is believe to brighten and hydrates our skin. AFTER FEEL: did not have any big impact to me, but i slept well after that. so maybe indirectly it helped soothes the eyes. fine lines and aging will speed up if we leave our eyes dehydrated. This masks has anti-oxidant avocado extract to help provides a nice moisturizing boost. SCENT: smelled more like light melon instead of avocado. puffy eyes also known as under-eye bags are usually cause by irregular sleeping hours, though its not a problem to me, this masks is believe to better firm and smooths the skin around the eye area. AFTER FEEL: i don't really have puffy eyes, no bags for my eyes. so this kinda serves more of a firming mask and more towards to relaxation to me. SCENT: light floral smell, quiet calming. of course the effects like reducing dark circles can't be really seen as of yet, due to the random days I used them and inconsistency in purchases. but they do soothes and relaxes my eyes a lot whenever I use them and best part is that most of them do not stinggg! with great prices down to RM2 a piece! for affordable prices, it works just so-so. no wow effects, but a good party pack or impromptu relax fix to the eyes. 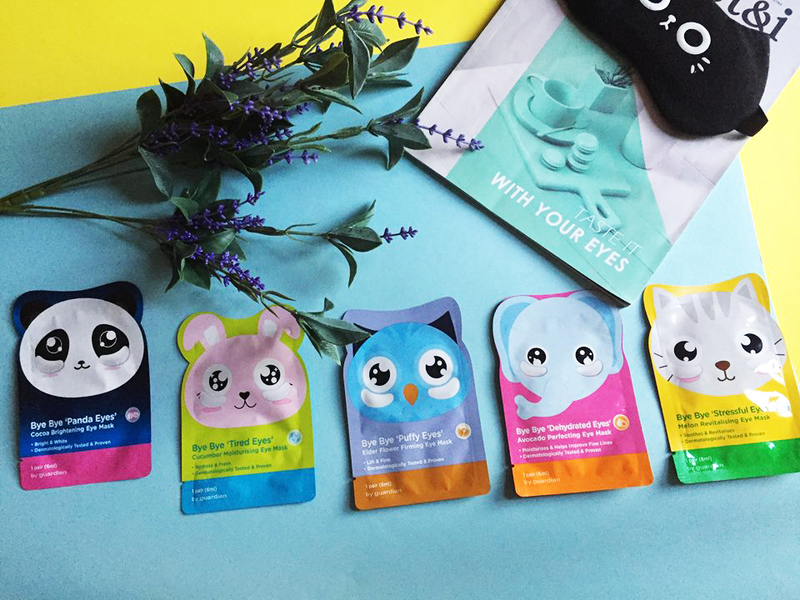 do you do sheet eye masks? 2 comments on "GUARDIAN 'Bye Bye' Eye masks series | Skincare Review "
I use these too. For my tired eyes. Especially the panda one. kannn! the fun and joy of masking the eyes!